The case of the new Radiomir 1940 3 Days (PAM00736) has the simple, elegant lines of the Radiomir 1940, the lugs being integrated with the case formed from a solid block of AISI 316L stainless steel and the cylindrical winding crown carrying the OP logo in relief. The diameter of 47 mm is that of the historic Panerai models, a tribute to the watches specially made for the commando frogmen of the Royal Italian Navy, and the sapphire crystal is slightly cambered. 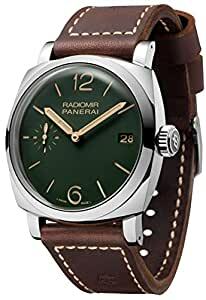 In this model too, the indications on the green sandwich dial are luminous with beige Super-LumiNova and they are in the classic Panerai style: large figures and linear hour markers, small seconds counter, and date window at 3 o’clock. The P.3000 hand wound mechanical calibre of the Radiomir 1940 3 Days, with a power reserve of three days, is 161â2 lignes in diameter, a dimension which originates from that of the movements fitted in the historic Panerai models. Solid and reliable, the movement has three brushed-finish bridges protecting the mechanism and a bridge with twin supports for the balance wheel 13.2 mm in diameter, which oscillates at a frequency of 3 Hz. Entirely developed and produced in the Panerai Manufacture in NeuchÃ¢tel, the P.3000 calibre also has the device for rapidly adjusting the hour hand. It is water-resistant to 10 bar (a depth of about 100 metres).